Bling. It’s an iconic sound that accompanies practically every contemporary PlayStation game, and it’s now been ten years since Super Stardust HD introduced us to it. All the way back on 2nd July, 2008, updates were released for the PlayStation 3 and Housemarque’s arcade hit which incorporated an all-new brand-wide metagame: Trophies. That’s right, today marks the ten year anniversary of Sony’s achievement system, which was not-so casually “copied” from the Xbox 360. The premise was simple: each game would include a set of increasingly challenging trinkets to collect, with retail releases (beginning with Uncharted: Drake’s Fortune a month later) boasting a highly desirable Platinum gong. Trophies were optional to begin with, but starting in 2009 they became mandatory. For some, the dopamine drip associated with collecting Trophies has become a way of life; we spoke to one of the world’s biggest hunters a few years ago, RoughDawg4, who currently has a cabinet stuffed with over 1,500 of the aforementioned end-game pots. 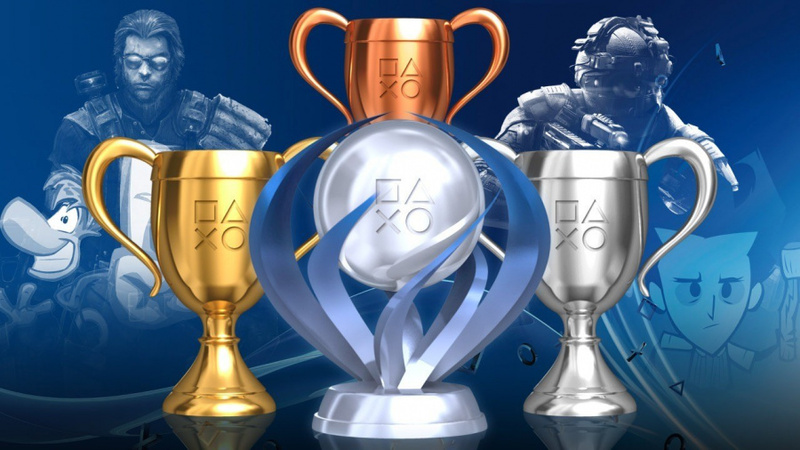 There are hundreds of thousands of Trophies to collect at this stage, spanning the PS3 and PS Vita through to the PS4. While not everyone sees the purpose of the Trophy system, we’ve always looked upon it as a kind of snapshot of our gaming career. And while it’s true that the virtual trinkets hold little to no material value, they can provide an incentive to replay games and try things that you may not have done without the extra nudge. But what’s your relationship with Trophies? How many have you earned over the past ten years, and which one are you most proud of? Are you a fan of the system overall, or is it something you largely ignore? Have you ever played a game purely to earn Trophies, or do you think that’s silly talk? Bling away in the comments section below. I personally love trophies. There is a sense of satisfaction when the little trophy pops up in the corner of the screen. I recently started playing Everybody's golf world tour on PS3 and shockingly it has no trophies. It's the first PS3 game I ever seen with no trophies support. For me, best thing they ever did with trophies was letting us disable the notification. I find them pretty irritating when I'm in a game. Worst trophy every though, was in Enslaved (by Ninja Theory). One of the trophies actually spoiled what was about tohappen in the next cut scene ('fried bacon' I think). Dumb. I like trophies. As long as I'm still enjoying the game, then I might try to get the Platinum trophy. However, if any trophies are too challenging or tedious to unlock, then I'll happily ignore those trophies. Whenever I see someone with a really high rank (say 30 or above) I just wonder about where they get all their time and patience from as I lack both. Today people take pictures with their smartphones not to look at them and enjoy them personally but to send them to all their friends (and anybody else they can reach too) and they play games not to enjoy games personally but to unlock some notifications to show to other people online. Probably it's just that I'm totally selfish but when I do something I do it only for me and for the personal pleasure and enjoyment I get from it. I remember when Super Stardust got those trophies. My favourite trophy was Late Boomer in a later dlc. It required numerous attempts, with lots of focus and skill, you had to save up and get 15 bombs but the bomb being your only weapon in that mode, it was easy to lose your nerve when things became hectic. Had a lot of fun getting that one, great challenge. But that game was also one of the first to get online leaderboards as well so there was plenty to keep players engaged with so many new and exciting systems in place with what was already a very entertaining game. As much as I like Trophies and achievements I feel they have stopped me from playing some great games because I became very OCD with them. If I could get plat then great but unless I couldn't get 75% or more I didn't play the game I would even test the game in a test profile to see the list. It's taken me a year to stop doing that and now I play what I see but trophies still take over a little like I'll go out of my way to get one if it means collecting stuff. I blame Uncharted and it's plat them Warhawk got them and they were a challenge but I do think they can ruin gaming sometimes. But I see people with like 400 plats and they go out there way to get duplicates of the same game like the Sega Mega Drive collection gives you 1 plat and the Sega Genesis collection does too. I enjoy finishing games that I really loved to get platinum trophy, but the trophy also has to be fun rather than annoying. I don't like "replay game on hard" trophy in uncharted series, but I like plat trophy that extend the games by making us playing the games in different way. Like using different abilities in transistor, getting different ending in nier automata, and searching for collectables in god of war. I like Trophies but I am NOT a trophy hunter. I do go for certain ones but others I am happy to forget about - they have to be Trophies that are related to something I want to do. I can't stand those that are related to rushing through a game to beat it in under a certain time or those Trophies you get for beating a game a 2nd (or more) times - like New Game+ or on a newly unlocked difficulty setting. MP based trophies are not necessarily 'bad' but I won't bother going for them if the MP itself doesn't interest me. As such I don't have very many Platinum Trophies at all - although I have 'finished' many games. Never really cared about trophies, but it's not as if their existence bothers me either. It's whatever. But holy **** PS3 is already 10 years old? @dark_knightmare2 Blimey! Greg Miller from Kinda Funny Games is a self confessed trophy junky and he is only at level 43. 7080 trophies and 66 plats later, it would be disingenuous for me to say trophies dont matter - although they are not as big a pull for me as they were in the ps3 era. Trophies were one of the pro points i used when justifying the purchase of a psvr over a switch too. Way i see it, trophies help encourage me to get more from a game as i will explore more of the game and try things i wouldnt have done otherwise if i am particularly enjoying it. That said, i generally wont bother doing something if i feel the game is making me do something for the sake of it and not respecting my time.although i did just spend 2 evenings trying to get that awful overheating trophy in Assassins Creed Origins. If anyone wants to check their trophy milestones PSNProfiles has all that information. My first trophy was (down) ‘The Rabbit Hole’ in Kingdom Hearts & my first platinum was Digimon Story Cyber Sleuth. Couldn’t have asked for better ‘firsts’ . @get2sammyb Being nitpicky here: why is the subtitle "Platinum"? The first platinum was released in August of that year if It's all correctly, in a patch for Uncharted. @LaNooch1978 To be honest, Greg doesn't game as much anymore as he used too when working at IGN. Besides, our own Sammy, who is at level 45, surpassed him. Best thing about trophies to me is being able to compare your accomplishments with others. I wouldn't know how to keep track of other people's progress easily without them. @LuckyLand I honestly hunt trophies just for me. I think most do. @Kidfried That's quite a feat. I'm just in awe of anyone with that much dedication. If I get even vaguely bored or frustrated by a game that I do not absolutely love I move on to something I enjoy more. @LaNooch1978 Agree. I respect all the dedication these people have. I'm just a lowlife level 18, even though I feel like I'm really putting in an effort. @Kidfried Gaming is first and foremost there to be fun. If I'm not enjoying myself then I'm not playing any more,even if I can see the game is amazing. Bloodborne is a good example. I had to quit because my mental health was at risk! @Kidfried Because I couldn't think of a better subheadline. I think trophies are a scourge. It hurts when I see the pain people go through in order to attain them. I have the notifications turned off, trophies hidden, and I literally never look at them. Not too shabby for a middle aged dad with no time. My favourite plats are FF15, Resogun and Pro Evo 18 (0.1% club). My favourite 1000g are Rockstar Table Tennis, Gears of War and Modern Warfare 2. Platinums seem a lot harder to grab than last gen imo. I saw a fair bit of that a few years back as well. Some people really suffering to get certain trophies and clearly not enjoying themselves. Not so much now, thankfully. @LieutenantFatman People buying notoriously lousy games for easy platinums are just as crazy! What a waste of money and time! Couldn't care less about trophies and the fact that someone who calls themselves 'RoughDawg4' does, only validates my view. I find it's quite nice to compare trophies with my friends to see if they've got more or fewer. Generally speaking, though, I'm an accidental trophy getter. They pop up as I'm playing the game without me trying to get them. There's one game I heard about a couple of months ago, all you do is keep pressing X for a couple of hours and, ta da, platinum unlocked. Doesn't look remotely entertaining either. @JoeBlogs Ha! You bronze baby! lol kidding. "Oh maaaan, I just want this Fractured But Whole plat now! So borrrrrred 😴"
I just don't understand why anyone would force their way through the process if it's that boring. Life is too short for nonsense like this. Of course, if people are enjoying it, then more power to them. But if it's a chore, why bother? @LieutenantFatman I am Mayo. Press X for 10 minutes and bingo probably the easiest plat ever!! I also think it’s cool that trophies have been slightly monetized. Granted it’s a grind for not much return but it’s better than nothing. I was a trophy hunter before knowing this and it added icing on the cake after it. Actually bought Elder Scrolls Online from “trophy cash”. Trophies can be fun. I only tend to go out of my way to get the platinum on games I'm particularly enjoying, or games where it's so easy I may as well. My very first platinum was for Ni No Kuni. I bought a PS3 just to play it. A quick look at the PlayStation app tells me I have 17 Platinums, 1987 trophies and am level 15. I didn't play it on the PS3 or get them all, but the most satisfying achievements ever were for the Orange Box. They enhanced the experience by getting the player to approach the games in new and interesting ways that I otherwise wouldn't have thought to do. Ah yes, that's the one. Didn't realise it was 10 minutes, crikey.. I agree, some trophies are fun to hunt down but if they're not, it's absolutely time wasted in my view. Can be an easy habit to fall into though. I have a fair few games with only one trophy left to get the plat! But had to abandon, because it wasn't worth the hassle. Those really grindy trophies which are there to stop you trading the game in too quickly. For me, trophies have been one of the greatest and one of the worst things that happened to gaming. Going for the platinum has ruined games like Nino Kuni (ps3) and Dragon Quest Heroes (ps4) for me. I wish I could control myself and just play the game once and be done with it before I get sick and tired of it. I always tell myself that it will be great to just see parts of the game I didn't get to explore and get some trophies along the way, but the closer I get to the platinum, the more I stray from that plan and find myself doing the most tedious tasks. I have a huge backlog I could be enjoying instead of grinding for hours and hours just for a trophy. I personally like the whole idea and was quite obsessed last gen but this gen not so much mainly due to less time playing. My greatest achievement was finally cracking beating green hill zone in under a minute on sonic generation. @AhmadSumadi hee hee I do have a lot of bronzes. I wouldn't say I'm a trophy hunter, but if I really enjoy a game I'll try and get as many as I can. Grindy online trophies hack me off, though. Never felt the need to have validation to play a game. Trophies should be a choice not forced upon us. I currently have 616 trophies. I love hearing the "bling" as I play a game. Once I finish a game, I go through the trophy list for the game and get any I'm missing, while also going through and completing everything on the game to get a 100%. I'm not a hunter or anything but I do find the Bling! Very satisfying, it was even my message tone for a while. What was everyone's for Plat? Mine was Batman Arkham Asylum still the one I'm most proud of I think. @hotukdeals "Never felt the need to have validation to play a game. Trophies should be a choice not forced upon us." But... they are a choice. There's no gun to your head telling you to earn them. Turn off trophy notifications and you need never give them another thought. 8752 trophies, 30 platinums (including a consecutive run of 1 every month since January 2017) and trophy level 32. I'm planning for my 10k to be a repeat of my very first trophy which was from Bioshock. @themcnoisy Wow, platinum sounds so much better than 1000g. I don't much about the specifics of what everything is called with Xbox achievements, but it seems like they got the names a lot better. 1000g just doesn't roll off the tongue. I almost think I would enjoy the games more without the notifications. Then after finishing it I could be pleasantly surprised with what I accomplished. I have 0 platinum trophies. That streak will probably continue. I used to just go for quantity over quality, but of late I aim for the more rare and obscure games and trophy lists. PSNP and TT sites are great in that they can tell you the rarity and adjusted value for the trophies. I also tend to get a lot of 100%s on non-plat games whereas others focus on plat count. Some incredibly easy (looking at u telltale games) some not so easy. My proudest are yakuza 0, armello, tales of zestiria. As a former Nintendo only gamer I didn't care about trophies at all until I got a PS4 last year and still at first I thought they were dumb because the first trophy I got was for persona 5. As anyone who had played persona 5 knows the first trophy you get is basically just for starting the game. So I was like "That was stupid, I didn't even do anything!" Then I kept playing and started getting trophies for actually accomplishing things in the games so I feel a little sense of prideand can say I line trophies now. My first plat was Nier Automata (yes, I looked up 2B's skirt 10 times lol) I have four platinum trophies now and I am either trophy level 6 or 7. Not gonna lie, I am probably a little too obsessed with trophies, but I don’t play bad games just for the trophies or spend an inordinate amount of time chasing a platinum or gold if I’m not enjoying myself. But I agree with the article in that the trophy list is a good general reminder and brief history of one’s gaming. @LaNooch1978 I guess that's personal. Bloodborne is the most fun I've had this year to be honest. But a game can be too stressful for some of to. Different people, different tastes. That's why I enjoy hunting trophies while others don't. @Kidfried That particular game was like my nemesis or something. I finished Dark Souls and Nioh without too many headaches but Bloodborne (and one boss in particular) had me on the cusp of smashing my controller. @LaNooch1978 Interesting! I still need to play Dark Souls and Nioh. If I remember, I'll get back to you about it once I've played those. I’m not a completionist, but it’s always fun to hear the sound of an unlocked trophy. I’m just level 20 with 8 platinums only. They're nice when I manage to earn some, but I never go out of my way to get them. I only usually go for the platinum if it's a game I've really enjoyed, that way my platinum list reads like a personal greatest hits, with things like God of War, Bloodborne, Shadow of the Colossus, Skyrim and Fallout 3 on there. And the Telltale games of course. By the way, I turned the 'bling' trophy notification sound off ages ago - am I the only one who finds it annoying? i have 40-odd platinums, and about 5500 trophies. my completion rate is better on PS4 than it was on PS3 (where i played a lot more games). my first platinum was uncharted 2. i have some duplicated, UC2 and UC3 on both PS3 and PS4 for example. i've every uncharted platinum except UC1. currently working on detroit: become human, but i've yet to complete the first playthrough (with work and world cup, no time). i've about 15 games where i am one or two trophies away from the platinum.. sometimes i find the requirements too tedious to bother, or too frustrating. (eg. i've only got the queen valkyrie to beat for platinum on god of war, but after about 45 minutes failing miserably, i left it before it completely soured a brilliant game for me - the insanity walkthrough on mass effect 2 was the same - that's only one i'm missing). My first trophy was in Burnout Paradise. Gaming has never been the same again. I'm not focused on obtaining platinums, I'd rather play another game from my backlog that stands at +200. Lately my Gems of War addiction has hampered my trophy hunting, but I currently have 15.890. Oh, I hated them at first, because they broke the immersion of the cinematic experiences I craved from modern gaming. "Here comes HD gaming, with these fantastic effects and no loading times and seamless DING! LOOK UP HERE! YOU'RE PLAYING A GAME! HAVE A MEANINGLESS BIT OF NONSENSE FOR GETTING THIS FAR! WE SHALL USE THIS TO MEASURE YOUR ABILITIES AGAINST OTHERS!" Nowadays, I'm okay with them. They've become part of the furniture (once I realised I couldn't turn them off, I had little choice but to accept them) and my OCD is satiated by making sure I have even percentage numbers for those games I can't or won't platinum. Sometimes, on rare days, they help push me a little further than I'd normally go, and some have been enjoyable to pursue. They also offer added frustration at times (I'm ashamed to admit that I have a platinum without a 100% statistic beside it, and sometimes even percentage numbers aren't possible) but, by and large, they're cool. The "ding" sound effect was my text alert for a while, too. I don't tend to chase them much anymore as I find my attention span has greatly reduced over the last 4 or five years, mainly as a result of wanting to move onto the next hot game. I do like to platinum games I love so my platinum list is a paltry 36 games but each is a game that meant a lot to me. I find the greatest barrier to a trophy hunt for me isn't difficult as I can be a really stubborn git sometimes, it's the time commitment that puts me off. @RedMan33 Go in with a 4 star team rather than 5. So maybe 2/3 black ball players and stick a couple of high silvers like Trent Alexander Arnold and Quersma in the squad to keep the overall level lower. Dont pick any crazy high rated players like Maradonna or Ronaldinho. Thats the best tip I have as inadvertently the AI team will have 1 or 2 less superstars. My own my club team was put together over 4-5 months without using mtx. By the end my mains were gk Ruffier, rb Alves, cb Rojo, cb Godin (bb), lb Hernandez, dm Medel, cm Nedved (bb), cm Saul, cf Werner (played as far right as possible), cf Lukaku (bb) and ss Jesus (positioned as a left winger). Amazing team. 4-3-3 Playing a deep defensive line, using the crash into defense strategy and the strategy to pick a player to stay forward (I chose Werner). Dont use the stay on the wing strategy or tiki taka as you will get punished in when you misplace a pass. Also never put a player in your squad conditioned as D or E. C isnt great but is about the same as a none conditioned player just with a higher chance of being given a better or worse form arrow. A or B rated players have to be in the squad. I played that mode and loved it! Best meta game. Fun fact. I pitched the trophy system and developed the creative direction. I was also producing PSHome at the time and we had a version of the system that had your tophies in a 3D space. My goal for the system was for gamers to know what type of gamer someone was by just looking at their trophy card. @RetroGamerBoy ...so it's all YOUR fault?! Seriously, that's pretty awesome, and it sounds like the integration with PS Home would've been really cool. @RetroGamerBoy Wow, that's amazing. Well you were very successful because I've always felt what sets Trophies apart is the fact that a person who plays a lot of games but not necessarily to completion will have a similar level to someone who plays fewer games but 100% finishes them. Amazing. I feel quite honoured that you posted to be honest. I looove trophies, I can say I'm a trophy hunter right now (lvl 46, 12 454 trophies, 197 plats, 945 golds). I don't care about the trophies themselves but the data they offer is neat, you can tell where some games have difficulty spikes by the drop in percentages between trophies earned chapter to chapter. I'm no completionist, but I like getting trophies for completing the campaign of whatever game I'm playing. I can look back and think "oh yeah, beat that, beat that, etc...". you know, i'm something of a trophy hunter myself. @RetroGamerBoy Really interesting. You nailed it with the concept. Trophies seem more tangible and rewarding than the gamerscore system on xbox. Gutted the ps home trophy concept never came to fruition. I was really excited by the prospect of seeing my virtual trophy cabinet. @get2sammyb it was great to see the article pop up on my phone. I've shared it with a load of the guys who were working at Sony with me. @RetroGamerBoy Woah, You’re my hero! @RetroGamerBoy that's so cool!! I really think you can pick up what type of gamer someone is from their trophies. Shame mine says I'm a lazy scrub casual. @LieutenantFatman my bad i got the name wrong. It is My Name is Mayo. I sadly have the platinum. I purchased it on my USA account then when it was released in UK i purchased it again thinking i would get another plat lol. But no the shared trophy list. It was only £0.99 and $0.99. @sajoey I don't think that will happen. If PS Home was popular and they didn't had to close it down to cut their losses, they would had made a VR version of it - with a trophy room. Also the platinum trophies should not look like each other in there, but should be shaped made in the image from something in the game. that would had been cool. @Twinkling82 Let's watch the language please. @Tasuki - what did I say? @Twinkling82 F___. Which is definitely not allowed here. Ok - I don't see it now, but I assume you removed it - but when I can't see the post has been edited, how should I know what the warning was about? I will take advantage of this space to confess that trophies have destroyed my joy in playing games. But long before trophies, the "stats" page diverted long hours of my spare time into repetitive and boring tasks (I used to print dozens of collectible maps for GTA San Andreas to achieve 100% in PS2). Now, you may ask: "But why do that if it feels like a chore?" Well, the feeling of satisfaction that's releasing on your brain when you finally get that long desired trophy is stronger than everything else, like heroin, probably. Do I need help? As I grow older, it seems that I care a bit less about achievements/trophies compared to 10 years ago. But I still try to get 100% in most of my games.